For the second game in a row, the Cardinals rallied from a deficit to beat N.L. West Division leading San Francisco. 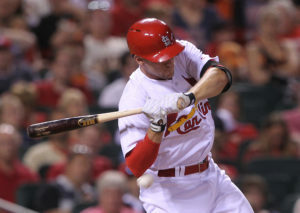 The Cardinals scored four runs in the sixth inning to help win 6-3 over the Giants, Sunday night at Busch Stadium. Matt Carpenter had three hits and an RBI and Carlos Martinez picked up his sixth win of the season. The Cardinals found different ways to take down one of the hotter teams. After losing on Friday night, the Cardinals used the long ball on Saturday, then took advantage of a miscue and broke down the Giants with hard hit balls. In Saturday’s 7-4 win, they were down 4-0 and homered four times in nine at-bats in the win. Sunday night, it was three hits, a walk, a hit batter and an error that sprung it open against starter Jake Peavy and the Giants bullpen. Mike Matheny said the team knew they could make another push. Ever since Matt Carpenter has come back after the birth of his daughter, he has been on a tear. He’s 15-of-35, a .429 average with six doubles, two triples and four RBIs bumping his batting average up from .249 to .280. Carpenter says he’s riding this wave as long as he can.